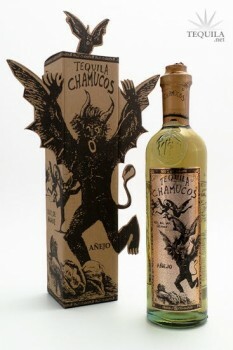 Older bottles or Chamucos Reposado were produced at Tequila Quiote, NOM 1433. Tequila Chamucos moved to Feliciano Vivanco y Asociados, NOM 1414, in 2008 where their first renditions of Blanco and Anejo were introduced, and now they have moved again to Premium de Jalisco, NOM 1558 in 2010. The unique packaging features cut-outs that are easily folded out to create a three dimensional conversation piece.